Tiaoyeer Brix Refractometer with ATC for Sugar and Fruit, Brix Meter Measurement Widely used in the manufacture or production of sugar, food, fruit, beverages etc. Versatile refractometer, with a brix scale of 0~32%, perfect for sugar measurement, contribute much for the management of product quality, delivery inspection, sweetness classification and so on. Easy to Use Please place 2~3 drops of sample on the main prism, close the daylight plate and look through the eyepiece for brix reading. * Maintain proper concentration of your cutting and grinding fluids & save you money! 1. Don't submerge the unit in water. 2. Don't use solvent to clean plastic lens. 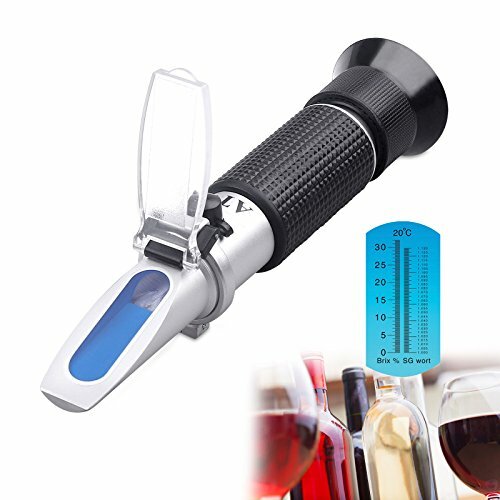 ACCURATE READINGS : The Brix refractometer can measure brix between 0-32%±0.2% and Specific Gravity between 1.000-1.130, Brix Accuracy: +/-0.2%. ADVANCED AUTOMATIC TEMPERATURE COMPENSATION（ATC）TECHNOLOGY (10℃~30℃)： Adjust Automatically to Compensate for Temperature, Which makes it even easier to get fast results. SIMPLY USE: Using the dropper to take a sample of wort and put it on the prism. Then hold the refractometer up to the light and look scale through the eyepiece, more accurate to measure sugars in verities of melon, fruits or juice. WIDE USE: The Brix Refractometer is ideal for Home Brew, Agricultural, Gardening & Educational Purposes, sugar content. PORTABLE SUGAR CONTENT TESTER: Easy to use, sturdy design, compact in size and light in weight, convenient to keep up and carry around. If you have any questions about this product by Tiaoyeer, contact us by completing and submitting the form below. If you are looking for a specif part number, please include it with your message.